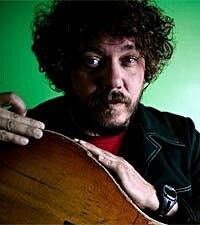 Bobby Bare Jr. is popping up all over these days as he revs up his his Carpool America tour with Blue Giant and plays dates with Justin Townes Earle and Drive-By Truckers. Touring behind his sixth album 'A Storm a Tree My Mother's Head,' released on August 31, Bobby has gone from a Grammy nomination at age six for a song he recorded with his dad, songwriting legend Bobby Bare ('Daddy What If'), to jump-starting his career after three children, one divorce, and, yes, a tree falling on his mother's head. Bobby is definitely kicking off this, his first album in four years, in a big way. Besides touring behind the album he co-produced with David Vandervelde, he also produced a memory album, 'Twistable, Turnable Man: A Tribute to the Songs of Shel Silverstein.' Plus, Bobby is the subject of an in-progress documentary. One spin of his disc (his first on the Thirty Tigers label) and it's easy to see why filmmakers find him fascinating. The songs on his album -- which he recorded in two days in a snow-covered Nashville cabin -- name-check everyone from blog.moviefone.com/tag/Elizabeth+Taylor/Elizabeth Taylor, Opie Taylor and Darth Vader to the Dixie Chicks. Many of his songs also tell personal stories about tragedies -- such as the time a 100-year old beech tree fell on his mother's head in the title song of the album and how his two-year old son almost died -- in surprisingly hilarious, tongue-in-cheek fashion. The Boot spoke to Bobby about all this and more, including where is in his musical career and where he hopes to go. Is your father's career a curse or blessing on your own career? It's not like I'm Jakob Dylan. Most people have no idea who my dad is, which I'm fine with. It's so much of a distraction and frustration for Hank Williams III [son of Hank Williams Jr.] or Shooter Jennings [Waylon's son], even though those guys embrace it in a big way. I've never played my dad's songs on stage. Justin Townes Earle is the same way. He has never really played any of his dad [Steve Earle]'s songs, because it's just not his thing. There are different ways to do it. The only shows I've ever done with my dad is him opening up my show at areas when I knew a couple thousand people. Then I'd say "Hey, here's my dad! He's really awesome." And people would laugh their asses off and have a blast. You could write a book about your musical history ... a fascinating book at that. I'm someone avoiding working a real job at any cost. I worked as a light guy and a crew guy. I first went on the road singing with my dad in 1973. Then by 1978 and 1979, I was selling t-shirts on the road [at my father's concerts]. I have probably sold t-shirts at every honky-tonk across the country. Then I graduated [from University of Tennessee] and did random band stuff but mostly everyone knew me as a light guy in Nashville. I started writing bad songs, and then I started writing better songs. Shel Silverstein critiqued every song I wrote up until he died. I would send him my stuff and he would tell me where I got lazy, where I'd lose him. He was a good cheerleader, which was a really big deal to me. By my fifth gig, I had a publishing deal. By my tenth gig, I had offers of record deals from Immortal Records and Lost Highway. Immortal [had signed] Korn, Incubus and me. It was awesome to be offered a deal with Lost Highway, but it meant more to have a record-deal offer from somebody that didn't know what my family background was. Then I have been with Bloodshot [Records] from 2001 until four years ago when I put out my last record. Why did you take four years between albums? Right when we were putting out the last record ['Longest Meow'], we had a second child. Then I started this thing where I was staying at home and writing songs to be with the family. Then there was a divorce and then I was starting the Shel Silverstein project. Then I got a divorce, had two small children and my [new girlfriend had our child]. Now we have a new baby boy. And my mom had a tree fall on her. It has been a crazy four years and gave me a lot of stuff to write about. Were the songs on this album ones you wrote specifically for it or did you dig back into the vault a bit? More than half of these songs were on a notebook I lost years ago. I should have given a thank-you card to the ex-wife. She found the notebook. You can see the page where I left the last album to [move onto] new songs for this album. I got probably 10 songs out of that lost notebook. I just follow [a songwriting system of] writing poems and plug them into whatever goofy songs I have. I co-wrote a lot of songs [for this album]. Most of the people in my band are 10 times more capable than I am with chord progression. How did you get Shel to critique your songs? I grew up in a family where Shel was a very valued member. Dad was always doing a project with him. He was around. He was a big part of our family. So I just asked him and he offered. What was the main thing he taught you about songwriting? Just to take an idea and push it as far as you can and then push it a whole lot further. You need to be writing something that was just not there before. Shel had a fearlessness in his writing. Whenever I am co-writing I notice, right at the [lyrical] area when people start backing down, that's the only place you can do something interesting, right on the area where you are teetering. When someone says, "I don't know if we should go that far," that's right where you should go. Your songs are so funny yet they're often about terrible things. If you can write really miserable songs and get a roomful of people to laugh along with you it makes those miserable things not so scary. When the tree fell on my mother it broke the vertebrae in her neck. She's fine -- that's her screaming on the record. What exactly happened to your son, who you wrote about in 'The Sky Is the Ground'? He was riding his bike on this hill by my mom's house. He was about two years old and was riding with his training wheels straight down the hill when [the bike] got away from [my mother]. At the bottom of the hill is a 12-foot drop with trees and the spot he hit. He went straight into a tree. I wrote the song from what I think he was thinking. The first thing he said was, "I just wanted to rock out on my bicycle, dad." Really, I don't know if he was terrified or thought "this is awesome." The paramedics spent more time with my mom, calming her down because she thought he was dead. She had to climb down and get him out of the tree. We're lucky she wasn't injured. How did you team up with David Vandervelde? I just love his energy, his personality, his bass playing is unbelievable. He came up with a lot of the bass parts. He's a really great recording engineer and I had him as a recording engineer and [thought of him when] I had to have a second opinion about what I was doing. That's what producers do. They tell you when you're sucking and when you've come up with great ideas. What do you remember most about recording with your dad? It was like my dad was an astronaut and one day he asked if I wanted to go to the moon. It was really cool to be in the studio and get to participate. Every kid wants to be like their dad and my dad just happened to have a really cool job. Shel was there, too, coaching me through it. I remember where I was standing, I remember everything about it. When did you first know your dad's career was different than the careers of other dads? I knew all along. When you go to a show and your dad's the guy they are all clapping for. Your older kids sometimes sing 'Daddy What If' when you perform. Do they like singing it? My daughter mainly likes to sing songs about dolphins. So at the end of all of this, what do you want from your career?